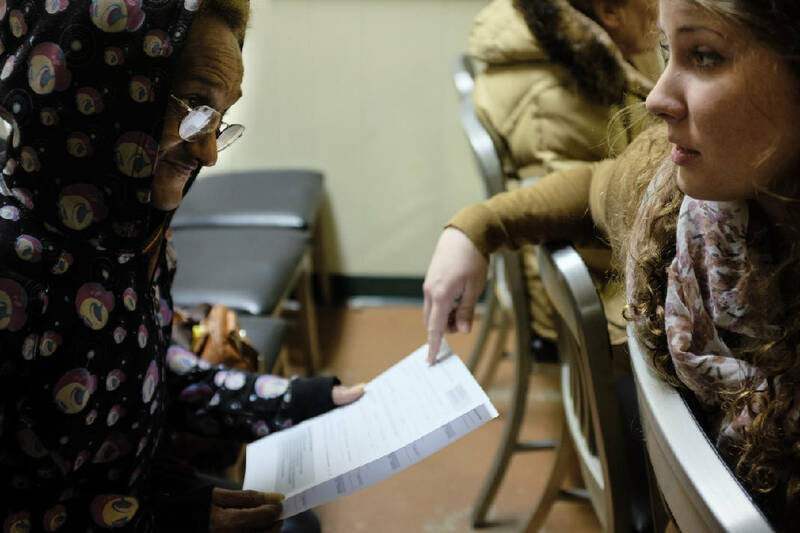 Anna Katharine Horne, right, helps Gwenevere Cook fill out paperwork in early March of 2015. Cook came in looking for help paying her utility bill, but Metropolitan Ministries can assist with those requests only during the second half of the month. Clients are referred to other providers when they need help outside that time frame. The Chattanooga Times Free Press has been named a finalist for the Pulitzer Prize. Reporters Joan Garrett McClane and Joy Lukachick Smith were named as finalists for the 2017 Pulitzer Prize in explanatory reporting for their work on The Poverty Puzzle, "an examination of the income inequality hiding behind Chattanooga's rise as the shining star of the South," according to the Pulitzer citation. Their reporting "combined data, research and human stories to render a full picture of poverty." McClane has been a reporter for the Times Free Press since 2007. She was previously named a Pulitzer finalist in 2014 for a series she co-wrote about the inner city's "no snitch" culture and how it contributes to growing violence in Chattanooga. Smith, who began working for the Times Free Press in 2009, has previously won the Malcolm Law Memorial Award for Investigative reporting. 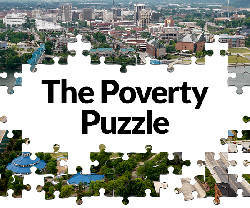 The Poverty Puzzle also won Tennessee AP awards for both multimedia presentation and video production, and was highlighted by the Solutions Journalism Network as a "a visually stunning, data driven series" that increased productive public conversation about key pieces of the poverty alleviation puzzle: family, church, education, jobs and community. An international consortium of more than 300 journalists, along with McClatchy and the Miami Herald, won the top prize in the explanatory reporting category for its work on the Panama Papers, a series of stories that exposed the hidden infrastructure and global scale of offshore tax havens. Other finalists included ProPublica, for a story on algorithms and how they shape our lives, and the staff of National Geographic, for an exploration of gender across the world. Considered the most distinguished awards in American journalism, the Pulitzers are handed out in 14 categories of reporting, photography, criticism and commentary by newspapers, magazines and websites. This is the 101st year of the contest, established by newspaper publisher Joseph Pulitzer. Public service award winners receive a gold medal; the other awards carry a prize of $15,000 each. The New York Daily News and ProPublica won the Pulitzer Prize for public service for uncovering how police abused eviction rules to oust hundreds of people, mostly poor minorities, from their homes. David A. Fahrenthold of The Washington Post was honored with the Pulitzer for national reporting for exposing questionable practices at Donald Trump's charitable foundation. The award for commentary went to Peggy Noonan of The Wall Street Journal for columns the judges said "connected readers to the shared virtues of Americans during one of the nation's most divisive political campaigns." The New York Times' staff received the international reporting award for its work on Russian President Vladimir Putin's efforts to project Moscow's power abroad. Times writer C.J. Chivers won the feature writing award for a story about a Marine's descent into violence after returning home from war, told "through an artful accumulation of fact and detail." Eric Eyre of The Charleston Gazette-Mail won the investigative reporting prize for writing about the scourge of opiate painkillers in poor parts of West Virginia. In troubled times for newspapers, "the work that wins Pulitzer Prizes reminds us that we are not in a period of decline in journalism. Rather, we are in the midst of a revolution," with new partnerships, technology and media taking the field in new directions, prize administrator Mike Pride said.